Kim Zombik’s musical path has been impressive. Where to begin? She’s toured with the New World Japan Philharmonic Orchestra; she’s worked with legends like Jimmy Cliff and Olu Dara. Without going into a Wikipedia-style inventory of her accomplishments, let’s just say Kim plays second fiddle to no one in the jazz world. She has come far, and gone far. This Boston native has made Montreal her base of operations for more than a decade. It’s fair to ask why she isn’t on the front page of the culture section of every newspaper in town all the time. As audiences around the world will attest, this artist leaves no one who has seen her perform indifferent. Au contraire, she’s in a class by herself. Using her voice and her body language to mesmerize and enthrall, Kim exploits every gesture, every vocal intonation, down to the tiniest detail to create a mood, a feeling, an experience. Whether or not you’re a fan of jazz, you’ll know instantly that you’re in the presence of a living legend. 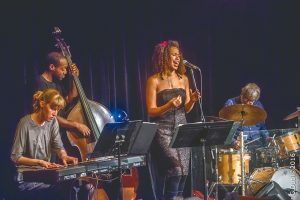 The eyes and faces of her audience don’t lie: Kim is a phenomenon, an artist capable of roping us in, living each word, every lyric, whether it be a jazz song or one of another genre. On stage she’s a mélange of strength and tenderness, calmly switching tone and mood at a moment’s notice. Everything counts in this pro’s arsenal. She’s always under control. They say that to be a great artist, you have to suffer – and Kim has not escaped living some bad experiences with the shysters of showbiz. So it’s little wonder she is sometimes reticent about how her image is used over that anarchic realm that is the Internet. A sensitive soul, she guards her own image with grace and elegance. Maybe it’s the yoga – which she practices and teaches – that make her performances her best business card. There is yoga in her jazz performances, and likely some jazz in her yoga classes. At the end of a Kim Zombik show at the Bistro Ste-Cath, you may not be able to say you’ve seen Billie Holiday sing. But you can boast you’ve seen the one and only Kim Zombik! Our facility exists to encourage community groups to self-finance through our “bistro-nomique” evenings. It’s a way to democratize culture and raise funds for your worthy cause. It’s all thanks to our artists!